New Gluten Intolerance Tests from Cyrex Labs Give Deeper Insight into Gluten Intolerance. Gluten is a protein found in wheat, rye, and barley. Gluten gives bread its fluffiness and chewiness. Research has shown gluten to be connected to many diseases such as celiac and several autoimmune diseases including a thyroid condition known as Hashimoto’s. Until recently, testing for gluten intolerance has been extremely limited and inacurate. Dr. Widenbaum, D.PSc., uses the most advanced testing in Gluten sensitivity and Gluten intolerance. We have the ability to accurately determine whether gluten is damaging your health and what foods are cross reactive with Gluten. The main issue with standard gluten intolerance blood testing is that it only looks at antibodies to one component of gluten called alpha gliadin. The literature shows that there are many different components of gluten that one can be sensitive to. This is problematic because if gluten is in fact destroying someone’s health and he or she does not test positive for alpha gliadin but is in fact sensitive to the other components (for example Gluteomorphin), then that person who should avoid gluten, would be cleared to eat gluten containing foods. Another extreme downfall in gluten intolerant testing is the fact that food proteins other than gluten can react in the exact same way as gluten. 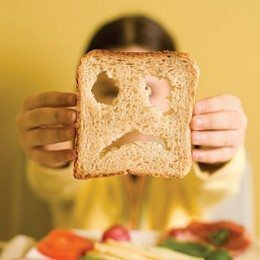 Researchers have identified the most common foods that have this gluten mimicking reaction. New testing is available to detect sensitivities to these foods. A prime example of the importance of having these foods tested is in the case of those suffering from celiac disease. Those patients are instructed to eliminate gluten containing foods from their diet so they switch to gluten free quinoa, for example. Quinoa is one of the foods that have the potential to react like gluten. Knowing this information is invaluable to those with known gluten intolerance. This saliva test is the best way to detect gluten sensitivities early. Standard blood testing for gluten intolerance typically tests positive only after their has been extensive damage to the gut or other tissues. Since autoimmune conditions such as Celiac disease and Hashimoto’s, Peripheral Neuropathy, Diabetes, have gluten and genetic components, this test would be of use for those with a family history of autoimmune disease. Taking a saliva sample is also easy to collect in the case of children who are suspected of being gluten intolerant. The gut of those who are gluten intolerant can be damaged by gluten intake. This damage can lead to what many call “leaky gut syndrome”. This means that things like large food proteins and bacteria that are meant to stay within the lumen of the gut now enters into the blood. The body’s immune then reacts to naturalize the “foreign invaders”. This reaction creates inflammation, which if allowed to continue, can damage organs and lead to other chronic diseases. Testing for intestinal permeability is important in the recovery from long-term gluten exposure. Is leaky gut ruining your health? 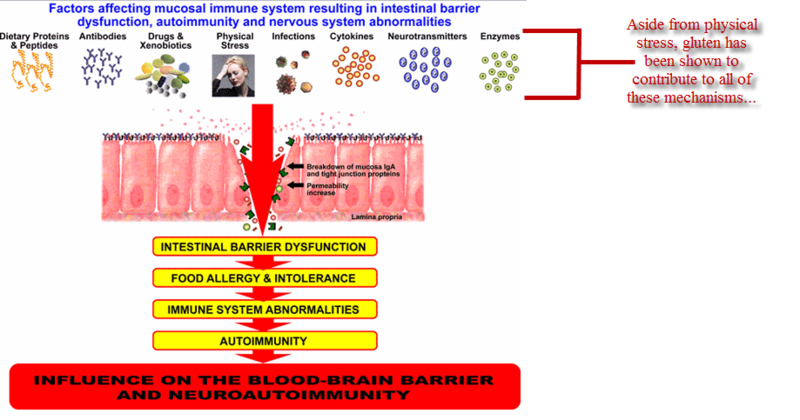 In many people, gluten and other food proteins cause long-term inflammation in the gut, which eventually leads to intestinal permeability, or “leaky gut syndrome.” Leaky gut allows undigested food particles, bacteria, and other materials to enter into the bloodstream where they can trigger the immune system creating allergies, sensitivities, and inflammation in other parts of the body. How can the leaky gut test help me? This test processed by Cyrex Labs (array #2) pinpoints which of these is causing leaky gut so your practitioner knows what to specifically target for faster and more efficient gut repair. This test can also be used to monitor the intestinal support used by your doctors. As the leaky gut improves, you should see a improvement in your leaky gut test results. Research has shown that components other than alpha gliadin can cause damage. As mentioned earlier, standard testing for gluten intolerance only tests for antibodies to one component of gluten, alpha gliadin. This test looks at the 12 most common reactive components of gluten. This is important because not all who are gluten intolerant test positive for alpha gliadin. Since gluten intolerance is highly associated with celiac disease, markers for autoimmune celiac is included with this test. This test is also referred as “Array 3- Wheat/Gluten Proteome Reactivity & Autoimmunity Profile”. Gluten intolerance is not as straight-forward as it may seem. Even though useful, standard blood tests for gluten sensitivities only look at one test marker to determine if one is intolerant, alpha gliadin. It is very common for someone who is in fact gluten sensitive to test negative because he or she is does not respond to alpha gliadin. Our unique test, processed Cyrex Labs (array #3), identifies 12 different components of gluten that can promote inflammation and negatively stimulate the immune system. These reactions and lead to allergies, celiac disease, and other autoimmune diseases. The wide-spread inflammation can also promote neurological symptoms such as fatigue, brain fog, loss of concentration and more. This Cyrex test panel also looks for the potential for gluten to cause addictive behaviors. Specific enzymes in the gut break gluten down into substances that promote addictive behaviors. 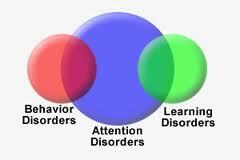 One of the major reasons our society has seen a spike in ADD/ADHD, depression, anxiety and other neurological dysfunctions is because of these substances. If your are considering starting a gluten free diet, knowing your potential for major withdrawal symptoms is important. How Can this Cyrex Gluten Intolerance Test Help Me? It is very possible that you can in fact be gluten intolerant and still test negative using the old, standard tests. The most import benefit of this Cyrex Labs gluten intolerance test is that it limits false negatives. This means if you have gluten concerns and want to know if you are truly gluten intolerant, then this is the test to order. Since gluten intolerance is closely related to Celiac disease, a Celiac disease testing panel is included with this test. Gluten has received the majority of the attention because it is the the most researched. It is extremely important to understand that other foods (even gluten-free foods) can react in the same manner as gluten. Many foods can cross-react like this, however, this test looks at the 24 most common foods that cross-react with gluten. Some common cross-reactive foods are corn, rice, coffee, and chocolate. This test can help you develop a clear and effective lifestyle plan. Many studies shows that autoimmune antibody can be elevated in the blood many years before symptoms occur. Cyrex Labs have now developed their array #5, a comprehensive autoimmune screen that helps in the early detection of autoimmunity. If detected early, natural and/or medical interventions can begin in order to minimize long-term illness and promote a better quality of life. Multiple autoimmune antibodies are tested in this panel due to the fact that more than 40% of those with auto-antibodies to one area have auto-antibodies to other areas of the body. The Cyrex Array #5 tests the gamut of autoimmune antibodies in order to minimize “missing” a potential autoimmune condition.